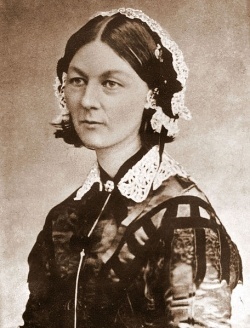 Widely recognized as a pioneer in the field of nursing and in adding much-needed respectability to the profession, Florence Nightingale was born on May 12, 1820 in Florence, which at the time was a part of the Grand Duchy of Tuscany. At a time in history when women of wealth were not expected to worry about much more than marriage and childbearing, Nightingale rejected long-term suitors in favor of service to others. The occasion of the beginning of the Crimean War, in 1853, gave her a focus. In October of 1854, Nightingale and her staff of thirty-eight trained volunteer nurses (all female) were sent to the Ottoman Empire. They arrived in November 1854 at the Selimiye Barracks in Scutari. With few medicines, and basic hygiene being neglected, mass infections were common and could often be fatal. She called for the Sanitation Commission to come in, and they improved ventilation and flushed the sewers. This reduced the mortality rate sharply as, until that time, about ten times as many soldiers were dying of sanitation-related diseases such as cholera, typhoid and dysentery. Despite these changes, Nightingale continued to feel that the hospital’s high death rates were caused by malnutrition, the lack of basic supplies and soldiers being overworked. However, upon her return to Britain, she began to amass evidence for the Royal Commission on the Health of the Army. Nightingale eventually began to determine that many of the hospital’s patients lost their lives due to the abysmal living conditions. Later, she fought for sanitary living conditions as being important. As a result, she helped reduce peacetime deaths in the armed forces and then worked on hospital sanitary design. In 1860, the Nightingale Training School at St. Thomas’ Hospital was established. The school is now known as the Florence Nightingale School of Nursing and Midwifery, and is affiliated with King’s College London. In 1859, she wrote Notes on Nursing, which was mainly designed as a guide for home health care, although it was also the basis of the curriculum at the Nightingale School and other nursing schools. During the 1870s, Nightingale was mentor to Linda Richards, known as “America’s first trained nurse”. This allowed Richards to go back to the United States with sufficient knowledge and education to found high-quality American nursing schools. In 1883 Queen Victoria awarded her the Royal Red Cross. In 1904, Nightingale was appointed a Lady of Grace of the Order of St John. In 1907, she was the first woman awarded the Order of Merit. In 1908 she was awarded the Honorary Freedom of the City of London. Beginning in 1857, she was often bedridden, and retired to London where she lived until her death on August 13, 1910. The American Nurses Association’s Nightingale Award is named for her.